Biochar application has multiple benefits for soil fertility improvement and climate change mitigation. Biochar can act as a source of nutrients and sequester carbon (C) in the soil. The nutrient release capacity of biochar once applied to the soil varies with the composition of the biochar, which is a function of the feedstock type and pyrolysis condition used for biochar production. Biochar has a crucial influence on soil C mineralization, including its positive or negative priming of microorganisms involved in soil C cycling. 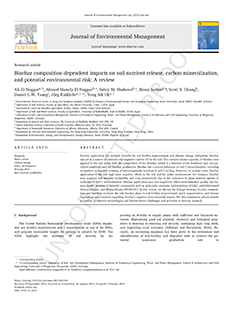 However, in various cases, biochar application to the soil may cause negative effects in the soil and the wider environment. For instance, biochar may suppress soil nutrient availability and crop productivity due to the reduction in plant nutrient uptake or reduction in soil C mineralization. Biochar application may also negatively affect environmental quality and human health because of harmful compounds such as polycyclic aromatic hydrocarbons (PAHs), polychlorinated dibenzodioxins, and dibenzofurans (PCDD/DF). In this review, we discuss the linkage between biochar composition and function, evaluate the role biochar plays in soil fertility improvement and C sequestration, and discuss regulations and concerns regarding biochar's negative environmental impact. We also summarize advancements in biochar production technologies and discuss future challenges and priorities in biochar research.